Brand New Third Edition - hundreds of numbers added. A complete reference & identification guide of casting numbers & part numbers. 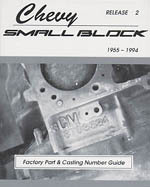 Covers all small block heads, blocks, intake & exhaust manifolds from 1955 to 1999. Listed by part, group & casting number. Book is pocket sized so you can take it with you.